The Keystone ski resort is an extensive ski resort in the White River National Forest. The skiing areas are located deep into the forest; the terrain gets steep at different locations giving skiers a thigh-burning skiing experience. The highlight of the resort is the state of the art training center by U.S. Olympic champions Steve and Phil Mahre. The resort has excellent snow conditions with plenty of snow in the winter, the snow machines cover for the lack of snow. The night skiing is best at Keystone. The night ski lovers will have a blast on the slopes dedicated to night skiing. Recently Keystone had several improvements in its infrastructure and now a single shuttle connects the entire network of villages. The high peaks of the majestic Continental Divide and the Ten Mile Ridge surround the Keystone ski resort. The resort is located near the beautiful, picture perfect Lake Dillion and the Loveland Pass is located to the east of the resort. Massive mountain peaks, the Dercum Mountain (11,640ft.) North Peak and the biggest mountain peak The Outback (12,200 ft.), surround the Keystone ski resort. Together the three giant peaks provide an outstanding skiing experience. The massive vertical peak of a whopping 3128 ft. is the highlight of the resort. Most of the skiing areas are located in front of the mountain, but the massive mountain peaks give access to the slopes deep within the valleys. The three mountains surrounding the resort provides skiing for every single level of expertise and skill. From easy nursery slopes to the highly challenging adrenaline rush skiing for experts and advanced skiers. The resort has 20 lifts including two gondolas, considering the size of the resort, the lifts are sufficient. Skiers can reach any slope and piste of the resort without much effort. The North Peak trails are challenging and suitable for advanced skiers. The Outback area has expansive terrain allowing skiers to explore the massive bowls perfect for powder fans capable of skiing and snowboarding at an advanced level. The trails located towards the front of the Dercum Mountain are perfect for skiers looking for slopes with flawless grooming. This has several cruising trails overlooking the massive area of the majestic National Forest. The terrain park at Keystone is perfect for snowboarders thanks to the light powder and well-groomed terrain. The terrain park includes a half-pipe that’s open in the evening if the weather permits, the terrain park that’s open in the evening is not common in the Colorado resort area. The beginners’ area at Keystone is located near the front of the resort near the three giant peaks Mount Dercum, The Outback, and the North Peak. The best nursery slopes are located near the Dercum Mountain, this trail is suitable for the wobbly first timers trying to stand on their skies and improve their skiing. Another perfect piste for beginners is the Discovery Learning Area near the Mountain Base Area. The Schoolmarm area has narrow but a green slope for beginners to cruise on wide easy slopes. For some more green marked trails, the beginners can head to the trails located on the Mount Dercum. In the green slopes in this area, skiers can enjoy the fantastic views of the River Run and the Outpost gondolas. For beginners, the longest and the best-groomed trail is 5.6 kilometers, it is the longest run in the resort. The Keystone ski resort is located at a very high altitude; expect shortness of breath, headaches, and chilly mountain air while skiing. Keystone is considered as a paradise for intermediate and advanced skiers as most of the slopes are marked blue, red, and black. The North Peak has the best blue marked trails. The Star Fire Trial is the most demanding when compared with other blue marked trails in the area. The Star Fire Trail is very steep; it is located right below the lift. Other blue marked pistes are located at the skiing area near the River Run Gondola, the Dercum Mountain, and the North Peak. The Mozart trail on the North Peak is a crowd favorite. Skiers have the option to take the Santiago Express chairlift towards the North Peak summit for some blue marked pistes. Follow the same trail and it takes skiers to the Spillway and the Coyote Caper in the Outback. The Outback has blue marked pistes that are slightly more challenging for novice-intermediate skiers and probably more suitable for advanced skiers. The trails near the Outback skiing area has plenty of trees. The slopes in the area are challenging and steep, intermediate skiers would find the slopes in the Outback challenging. But, the good thing is that this area is not crowded, giving skiers plenty of time to practice and ski to their heart's content. The Keystone mountains offer plenty of challenging thigh-burning skiing for expert and advanced skiers with the red and black single diamond pistes. The toughest areas to ski in the Keystone ski resort in the trails located on the Outback Mountain near the Black Forest area. This region in the Black Forest area is filled with trees, steep slopes, giant moguls, and Outer Limits. The Windows and the Black Forest are the toughest areas, the trials taking near the Outback lift has a limited but sufficiently challenging off-piste for expert skiers. The slopes in the area are wide, expansive and filled with powder in the areas above the tree line. The South Bowls have some massive bowls filled with powder; the area is a playground for expert and advanced skiers with plenty of powder. The Last Lift Bar is an ideal après spot with free live music from local singers and artists. The Bar has excellent DJs who start the party in the evening. The Last Lift Bar has a wide range of beer and other beverages at a reasonable price. The live music starts at 8:00 pm on weekends. The Snake River Saloon is one of the most legendary après ski locations in Keystone. A local and international favorite, the Bar has a lot of drink options and delicious American food. The live music at the Snake River Saloon is excellent and better than the rest of the bars in the area. The bar is open from 6:00 pm onwards every day. The weekend has some wild parties so try to get in early to get a good spot. The Goats and Whiskey bar is another popular and legendary après ski spots, the bar is always crowded especially during the happy hour that opens daily from 3:00 to 6:00 pm. Locals and international bands often play at the bar when the ski season is at its peak. The Friday night and the weekends are fun and the party goes on until the early hours of the night. The Dos Locos Bar and Restaurant as the name suggests have a Mexican theme and the best place to get the best margaritas and tequilas in Keystone. The bar has massive television sets that telecast sporting events and skiing and snowboarding videos. The Dos Locos is open from 2:30 pm to 6:00 pm. The bar has the longest happy hour in Keystone. The Kickapoo Tavern is an ultimate spot for après ski. The bar is located right at the base of the River Run Village and just a short walk across the bridge from the gondola. The Kickapoo Tavern has a long list of wines and local and international beers. Keystone has the highest snow-tubing hill with different lanes. The snow tubing slope has its own dedicated lift that gives easy access to the slope. The different lanes are designed to offer different speeds in each run, choose the run that seems fit to take with kids. The snow tubing slope is located at Adventure Point near the Kidtopia snow fort on the Dercum Mountain. The snow tubing cost $34 per session for adults. There is nothing better than taking a snowcat ride to the top of the world. The Family Adventure Tour takes visitors on a trip of a lifetime on a giant snowcat. Enjoy the breathtaking views from the warmth of the massive snowcat. The picturesque views of the Continental Divide, Gore Range and the Ten Mile Range will surely leave everyone breathless. The tour is 45 minutes long, children will really enjoy this once in a lifetime experience of riding a snowcat. The tour is open from 3:00 pm to 4:00 pm daily. The ticket costs $35 for children and $42 for adults. The perfect combination of a bicycle and skies, the snow bike is a unique machine designed to explore the expansive terrain of a ski resort. The snow bikes are easy to operate and does not require skiing expertise, its the best way to explore the area. 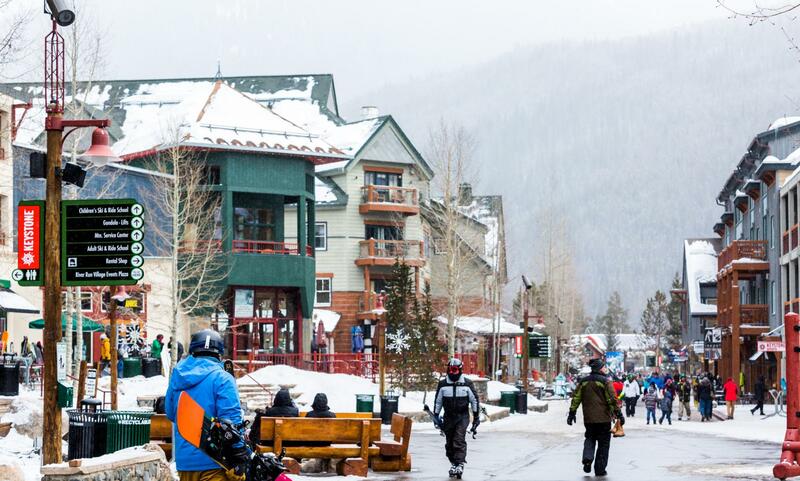 Take lessons from experts to experience the joy of snow biking in the beautiful Keystone resort. The lessons and tours are available at 10:00 am, 12:30 pm, and 3:00 pm every day of the week. The ticket to snow biking costs $ 49 with a lift ticket or a season pass and the price goes up to $64 without a lift or season snow pass. Located on the top of the Dercum Mountain is a fantasyland for children to have some fun in the snow. They can see the world’s largest Snow Fort. The Snow fort has slides, climbing nets, and castle towers. The Kidotopia is perfect for children and adults, there’s enough to keep everyone busy. The Kidotopia is open from 9:00 am to 4:00 pm. Snowshoes tours are available at the Nordic Center for everyone willing to enjoy the expansive trails. Keystone has over 35 miles of trails for each difficulty level. The trials go through the White River National Forest.